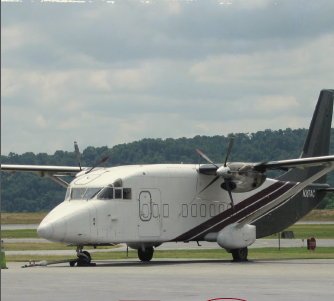 For 100 years, Hartzell Propeller has designed, manufactured, and certified propellers for the aviation community. What better way to celebrate our 100th anniversary than by remembering our proudest historic achievements? This week, we’re highlighting the Shorts 330, the first aircraft certified with a 5-blade propeller. The Shorts 330 first took flight in August 1974. A prototype aircraft designed by Short Brothers of Belfast, the 330 was an economical passenger turboprop made to carry up to 30 passengers. It offered the short takeoff and landing abilities and rectangular body style of the Shorts Skyvan, but with the longer wingspan and fuselage that enabled it to carry more passengers. In 1975, as the 330 was prepared to transition from prototype to a production-ready aircraft, Short Brothers and Hartzell Propeller came together to form a partnership with an ambitious goal to make the Shorts 330 the first aircraft certified with a 5-blade propeller. The Shorts 330 was among the first generation of turboprop aircraft to utilize the venerated Pratt & Whitney PT6 engine, which offered a high horsepower. Hartzell’s engineering team needed to deliver a custom-built 5-blade prop to work in sync with the powerful PT6. Needless to say, the design was successful. Hartzell has now shipped thousands of 5-blade propeller systems across a wide range of aircraft. These innovative 5-blade props enable aircraft engineers to take advantage of modern engines to increase the power and performance of their aircraft. One would think that adding more blades would increase the weight of the aircraft, but by using composite materials like Kevlar and carbon fiber, Hartzell props can maintain or reduce the weight of the propeller system. In 2006, Hartzell introduced ASC-II Advanced Composite Propellers. These composite airplane propeller systems boast an improved strength to weight ratio, performing better than past 5-blade props without sacrificing safety. Today, Hartzell is still pushing the boundaries of aviation technology, delivering optimal performance, strength, and durability with carbon fiber blades.